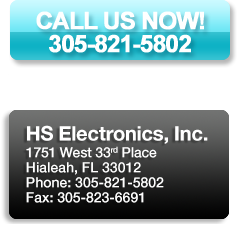 HS Electronics has been a supplier of electrical components since 1965. We have over a century of combined connector knowledge, and have provided our customers within the aviation, industrial, marine and telecommunications fields, both domestically and abroad, with reliable service and quality parts. We’re located just minutes from Miami International Airport; so feel free to stop by, or give us a call, and let our sales team assist you in acquiring the desired products.